Auto flags can be used in different places, they have diverse applications and are suitable for various purposes, bringing greater flexibility to your advertising/promotional endeavors. The flags can be used as pavement/driveway/entryway/sidewalk signs; at arenas; branded automobile stores; car dealerships; car hire, auto repair, used vehicle, automobile accessories/fittings shops; and even basic places like parking lots, fuel stations and car wash services. No matter where or how they are used, these stunning automotive flags impactfully deliver your message, 24x7x365! 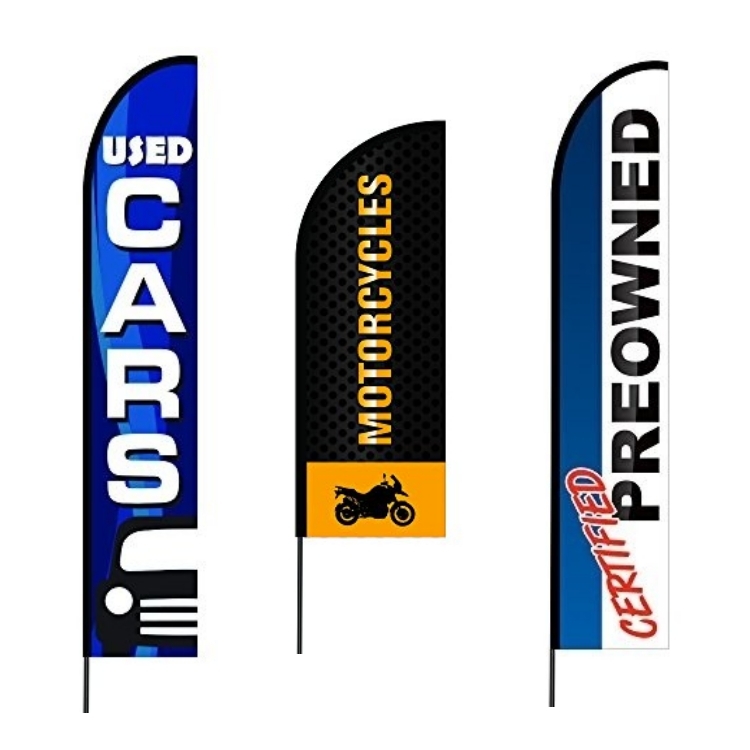 Automotive flags are available in different sizes, designs, shapes, and dimensions, and can be customized with your brand logo, image, message, graphics or whatever else you desire! In addition, these flags come with varied pedestal options, functionalities and high-quality printing mechanisms that produce super-clear print, vibrant colours, and stellar graphics. Printing options include digital printing, vinyl printing, direct dye sublimation, one/two/three/full colour imprinting, single and double-sided, and custom digital printing. Auto flags attract quick attention, increase brand recognition and awareness, and help develop a strong client base. Some auto flags have one side that appears to be horizontally flipped, while others have right-reading backsides. Car flags can also be tailored for directing specific messages to defined target audiences. Additionally, flag pole hardware becomes doubly effective when combined with custom logos, graphics, and text on the flags, giving you updatable, dynamic and cost-effective ad material. 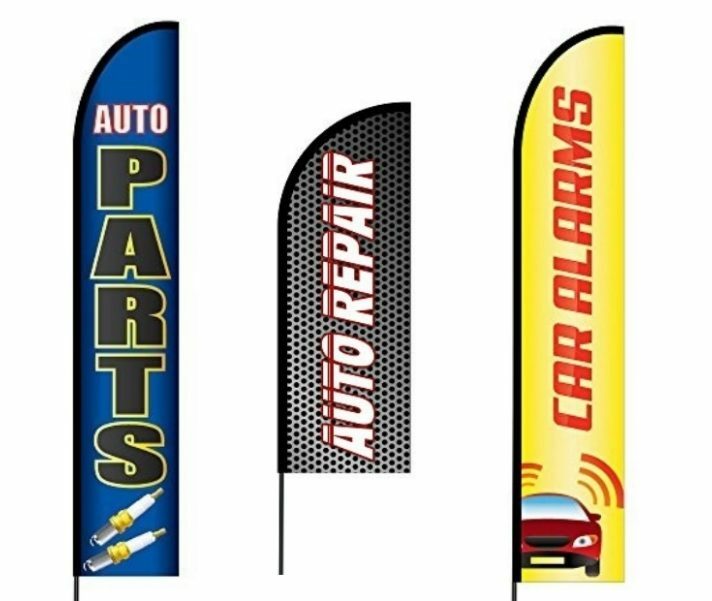 Therefore, when combined with the requisite hardware, automotive flags become an all-encompassing advertising solution. Other advantages of automotive and auto dealer flags are that they can easily be assembled, taken down, moved, transported, and some auto flags come in compact carrying bags, making them convenient and portable. All of these are vital characteristics of car signage. Automotive flags are made using premium-quality polyester fabric, while the pole sets, base/ground spikes are also very robust. The overall flag package is strong enough to last for years and light enough to beautifully flutter even with a light breeze. The existing hardware can be retained and the flags can be changed as per changing requirements. Auto flags are therefore versatile, affordable, durable, and agile solutions to your automobile signage needs. 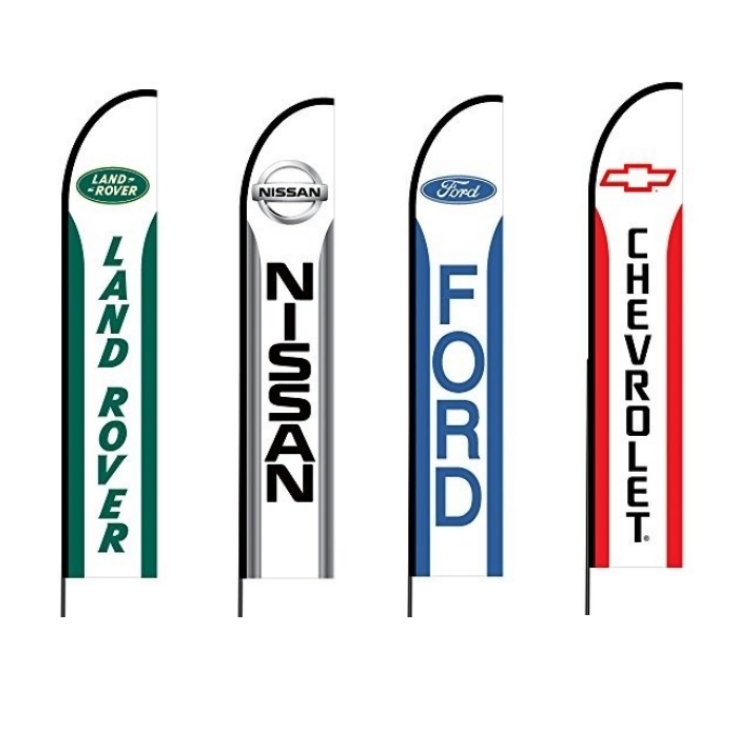 Automobile flags are engineered to withstand almost all kinds of weather conditions. You can fearlessly advertise in the wind, rain or snow, with zero hassles, thanks to the use of strong, high-quality fabric and materials. While the intelligent flag pole systems prevent the flags from getting twisted or entangled, the banner stands spin with wind gusts, saving the flag poles from tipping or falling. An additional advantage? The car flag’s elegant turning motion instantly draws the attention of onlookers. 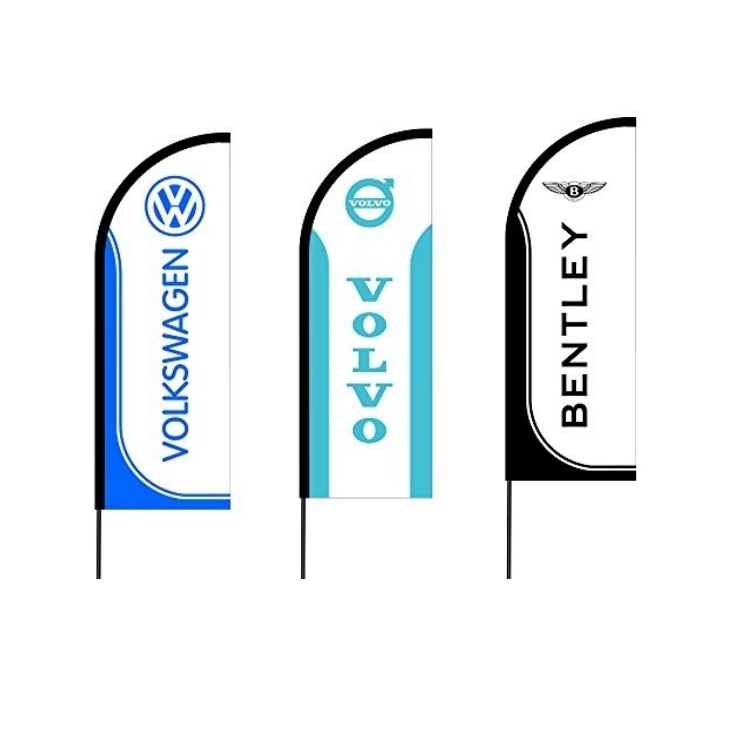 The numerous options, benefits and value additions of promotional auto flags make them excellent tools for auto brands to get noticed, improve brand recognition, announce/advertise effectively and aesthetically, and of course, garner lasting customer admiration!